Valentine’s Eve is coming up fast and you’ll want to be part of the Key West love story. Participate by taking your sweetie to the annual Anne McKee Artist’s Fund Fine Art Auction on February 13. Let he or she have the excitement of sipping champagne and nibbling hors d’oeuvres while bidding on that special piece of art they spied in the auction catalog or at the art preview. If you’re more of a traditionalist, select a piece in secrecy as a surprise. You’ll be supporting the local arts and showing your special someone you care on tangible and intangible levels. Plus you could be the lucky winner of one of the raffle prizes: a $100 gift certificates to the Commodore restaurant. This year’s auction offers a very special piece by the internationally renowned Sal Salinero. Here’s a rare opportunity to own art by an artist referred to as Key West’s Hall of Famer. 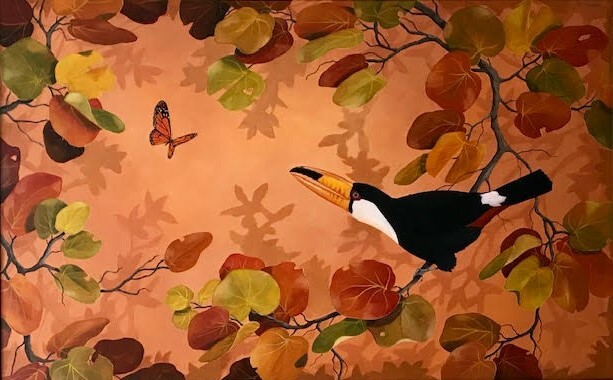 The whimsical, large format on canvas is titled “Toucan.” Painted in 1985 and valued at $9,800, the scene features a black and white toucan with the characteristic yellow beak against a red sea grape background. The softly stunning color palette reflects Sal’s two loves—Key West, where he was born and recently died, and the rainforest of Central America where he lived much of his adult life. His paintings of wildlife and tropical foliage reflect an understanding of nature, of humankind, and a spiritual sense of perfection in nature. Skilled as a master still life and trompe l’oeil artist, his sensitivity and ability to capture the nuances of reflected light have earned him an enviable position in the art community as well as with international collectors. Sal was a long-time supporter of the Anne McKee Artist Fund, donating works of art since the very first auction. He was honored with the Miriam B. Good award in 2011. A second aspect that makes this year’s Auction special is the honoring of local artist Fran Decker as the winner of the Miriam B. Good award. Fran’s gallery, Frangipani, represents and supports local Keys artists. This is one way Fran lives her motto, “a rising tide floats all boats.” She’s involved in many other artistic endeavors as well. 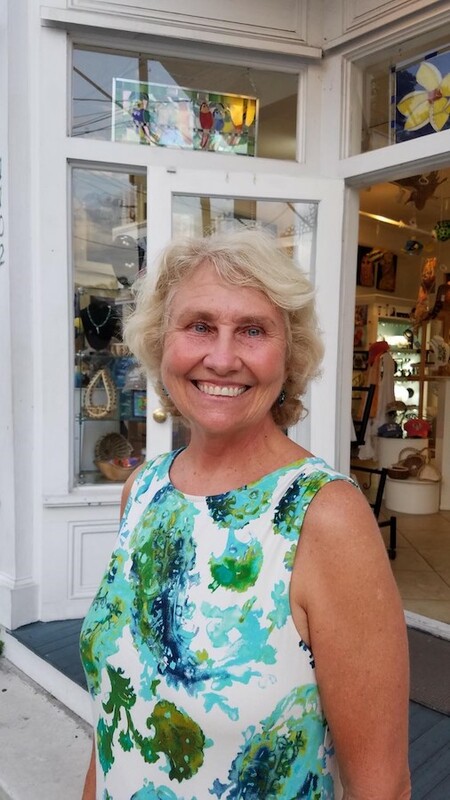 Fran is a founding member of the Key West Plein Air Painters, president of the board at the Key West Art Center, and an active member of The Studios of Key West. She also serves on the board of Old Island Restoration Foundation. Although very busy supporting and promoting the arts, Fran still finds time to exercise her considerable artistic talents. She paints evocative scenes of Key West and the Florida Keys, as well as other seascapes, landscapes, and fantastic images from a whimsical dream world. Since her arrival in Key West in 1988, her beautiful canvases have highlighted classic conch houses, Key West landmarks, and tropical flowers and animals. Always the key aspect of the Auction is the amazing work of the fifty generous artists who have donated half the winning bid price for their work to fund grants for their fellow local artists. You’ve seen their names all over town—at art centers, gallery talks, featured exhibits, award announcements, art shows, and more. The auction simply wouldn’t happen if it weren’t for their generous and faithful support of Anne McKee’s mission: Artists Helping Artists. To date, the effort has raised more than $280,000 to further the careers of over 275 Monroe County artists. As a direct result of the intake at this year’s auction, a new grant cycle will open March 1. The auction is being held Wednesday, February 13, at The Studios of Key West, 533 Eaton Street, Key West. For more information, check out www.McKeeFund.org. Tickets are $25 at the website or at the door. Doors open at 6:30 p.m. for art preview, champagne, and hors d’oeuvres. The Auction starts at 7 p.m. Don’t miss this unique Valentine’s Eve opportunity.